Read on to learn why you should be using CO2 producers, how to use them, and things to watch out for. What is CO2 and what can it do in the grow room? CO2 is an odorless gas that is naturally present in the atmosphere and is essential to growth and development of all plant life. The naturally occurring concentration of CO2 in the air is around 400ppm (parts-per-million). If you are growing outdoors, you will be limited in introducing additional CO2 to your plants. However, growing indoors presents the opportunity to introduce extra CO2 to benefit of plants. When you are able to raise the concentration of CO2 in the grow room to between 1,200-2,000ppm, you will see heavier yielding plants that develop much faster, and are heat resistant. Introducing extra CO2 to your indoor garden is not only incredibly beneficial for your plants, but also incredibly simple. 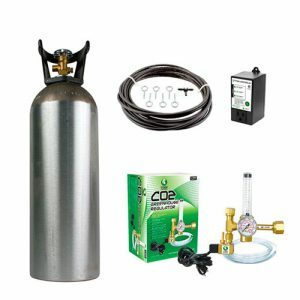 With the right preparation and an hour or two of free time, you can easily set up a system in your grow space to introduce supplemental CO2 at the right time and concentration. The most common method of introducing extra CO2 to a grow space for home growers is a standard tank and regulator kit. A CO2 tank, usually either 25 or 50 gallons and made of aluminum, is filled with compressed CO2 and brought into the grow room. This tank is then hooked up to a regulator, which is then plugged into either the wall or a CO2 controller. The regulator allows you to control the flow of CO2 as it is emitted from the tank. This helps ensure that enough CO2 is being released to have a beneficial effect on the plants, while preventing excess from leaking. 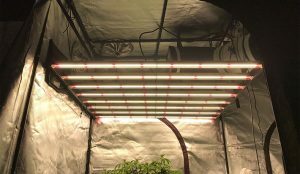 The CO2 is then emitted through tubing that is hung throughout the entire grow room, above the canopy of the plants so that it can descend down upon the plants as it is released. 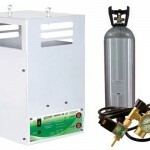 Not as common as using a tank, but still a very popular option, is creating extra CO2 in the garden using a generator. 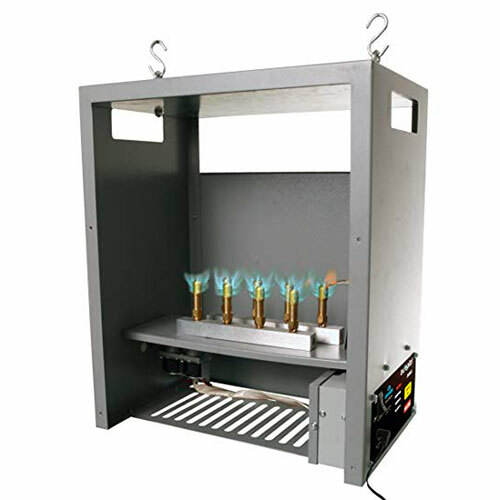 When liquid propane (LP) or natural gasses (NG) are ignited, they produce CO2 as a result. The burner consists of as few as two, or as many as ten burners. These are housed in a metal box that is hung from the ceiling of the grow room above the canopy of the plants. A tank of either liquid propane, or a natural gas is then hooked up to the regulator, which is then plugged into a CO2 controller. As the gas is released into the generator, the burners ignite it and CO2 is produced. It then descends down onto the plants. This process can introduce a good deal of heat to the grow room, as it relies on combustion to function. This is important to consider if you are growing in a small tent or an area prone to high temperatures. You may find yourself constantly fighting to keep your grow room temperature at an ideal level, and will need a grow room air conditioner. There are numerous ways of creating extra CO2 in your garden naturally. 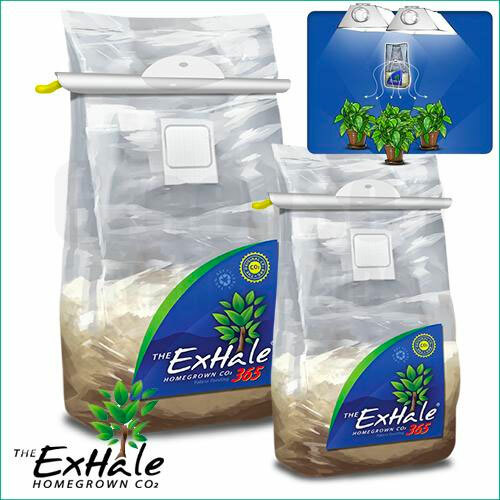 We carry many products for these methods, from bags containing CO2 producing fungi to pads that are hung above the canopy of your plants and react chemically to the humidity present in the room to release CO2. 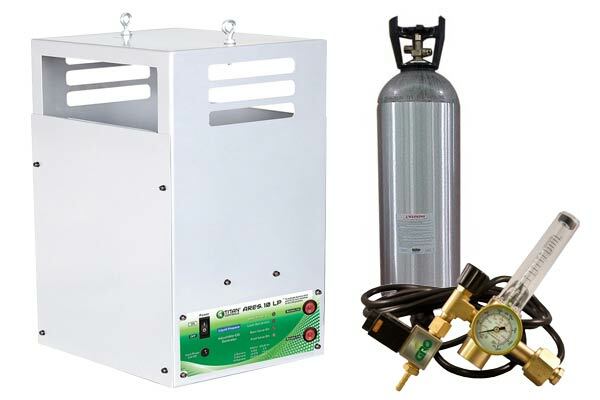 Naturally producing CO2 is a quick and inexpensive option that can serve as a helpful backup plan if you run out of CO2 in your tank unexpectedly or if your generator stops working. However, we do not recommend using natural methods as the primary way of introducing extra CO2 to your garden. These are less efficient, and more difficult to regulate as they can not be shut off by a CO2 controller. Just as important as your method of bringing in CO2, is the method of controlling it. If CO2 is not controlled it will release too much, which can be detrimental or even fatal for the plants. Another common issue is releasing CO2 at the wrong times. This will waste a valuable resource as well as your money. A CO2 controller serves the purpose of monitoring the total concentration of available CO2 present in the grow room’s air. If necessary, it will shut off any connected CO2 producing devices when the ideal level is reached. Once the concentration has depleted, the controller will turn the CO2 device back on. 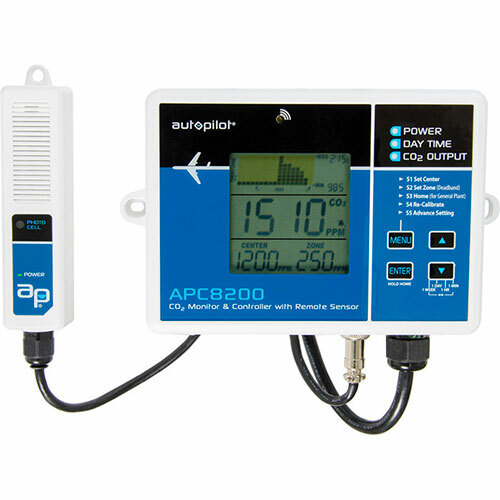 These controllers are also equipped with photocell, which allow them to determine if it is day or night time. A controller with photocell will keep CO2 devices on the same schedule as grow lights. This is critical, as CO2 only needs to be present for the plants during their daylight hours as that is when photosynthesis occurs. Releasing additional CO2 during the period of the day where the lights are off in the grow room is a complete waste. While knowing how to introduce the additional CO2 to your garden is important, knowing how to properly setup your garden for the high concentration of CO2, and when exactly to utilize it is just as important. As discussed in the “Controller” section above, it is important to avoid releasing any extra CO2 during the lights off period. However, this is not the only time it should be avoided. If you are using higher intensity grow lights such as HIDs, LEDs, or CMHs, you will greatly benefit from CO2. Fluorescent grow lights, however, do not product a ton of useable light. T5's and CFL's are great for propagation, or supplemental lighting. On their own, however, they are not intense enough to benefit from additional CO2 supplementation. Additional CO2 will only be as effective as your grow lights! CO2 supplementation should be be avoided unless the grow room or tent is completely sealed. Many indoor growers choose to run an inline fan 24/7 in their garden to help control heat and humidity. This unfortunately will not work if CO2 is going to be added to the room. The fan will exhaust the majority of the CO2 before it could have any effect on the plant’s development. Instead, the room should be set up as a “closed loop”. A closed loop room does not run a continuous exhaust fan as an open loop room does. Instead, this type of room only utilizes the exhaust fan when temperatures, humidity, or CO2 rise to an unsafe level. 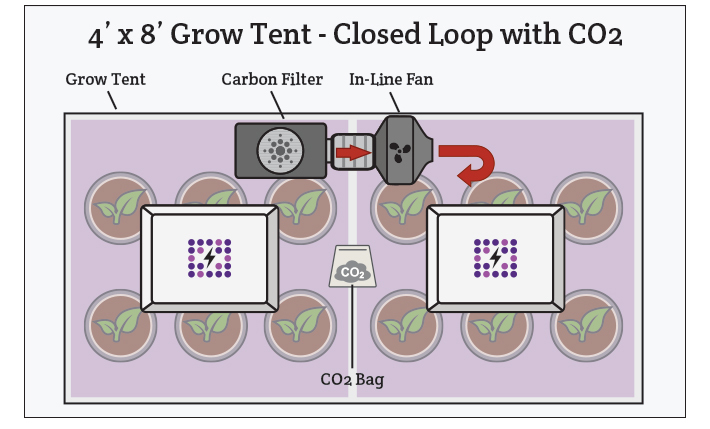 Example of closed loop grow room. As you can see in the illustration, the closed loop room is completely sealed. There is no exhausting of the air within the room to outside of it. Instead, the inline fan is merely used to help control odor and circulate air. You can read more about the differences between closed/open loop rooms, and ventilation systems in our article about Grow Room Atmosphere and Ventilation. Being exposed to high levels of CO2 can have fatal results. If the equipment used to produce CO2 in your garden is setup correctly, with the room properly sealed, there is nothing to worry about. But it always a good idea to be prepared for the worst case scenario. CO2 is a completely odorless and colorless gas, so it is unlikely you will recognize its presence in time. It is wise to invest in a plug in CO2 detector or alarm that can be plugged into any home outlet. Install this outside of the grow room of course, and it will alert you of any issues. If your goal is harvesting healthy, robust plants, with a heavy yield, you should be supplementing with CO2. With the right grow light system, CO2 producers can supercharge your growth like you've never seen before. If you want to use CO2 in your garden, but are having trouble choosing a system, reach out to us! You can call us at 888-815-9763 and speak with any of our experienced professionals about CO2. We are happy to discuss any other aspects of gardening as well! Want to learn more about creating the best environment possible for your plants? Check out our other articles in this learning center.